The London Horror Comic gets four out of five stars in this month’s issue of Sfx magazine (#165 in stores now). Charlie Hodge describes one story as laugh out loud funny and like a horror Curb Your Enthusiasm – which had me punching the air on the platform as I read the review on the way to work. This places it on equal footing with Garth Ennis’ Dan Dare (4 stars also) and slightly ahead of DC’s The Un-Men (3 and a half). The fact that this little self published book of mine can stand with the big guns makes me feel like a parent at a school sports day, watching his child keep pace with Linford Christie. There’s also an excellent piece about Mark Millar and Bryan Hitch’s upcoming work on the Fantastic Four, an interview with the superb Simon Spurrier and Warren Ellis’ entertaining take on the new Dan Dare. Go buy. Roll on 2008 and issue 2! The Biography Channel did a chilling documentary about Mark Chapman a few years ago. It worked well because it showed what The Beatles and Lennon meant to Chapman at specific points in his life and how events turned Chapman’s hero worship into hate and led him to commit murder. Unfortunately, this latest film does none of that. It follows Chapman’s life in the eight months leading up to the act – an odd decision, since from the beginning and throughout the film, Chapman is presented as being nothing other than crazy. You sit watching the film hoping to gain some insight into why he did what he did, but all you’re presented with is a running monologue of how he felt. That said, the performance of Jonas Ball as Mark Chapman is brilliant and manages to nail that slightly off-kilter creepy quality you’d expect to find from a man on the street. David Mamet’s script is biting and hooks you just as well on stage as it does in the screen version – good dialogue travels. My only problem was that the film with Al Pacino and Jack Lemmon was so well acted, it throws down a difficult gauntlet for this version – or any stage version – to live up to. 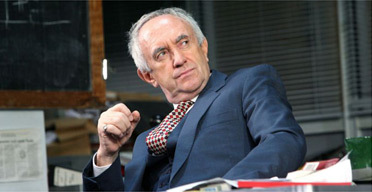 Jonathan Pryce is convincing as Levene but doesn’t, IMHO, handle the change in moods from desperation to smugness and desperation again, as gracefully as Lemon did. The change in what Levene wants and how he goes about getting it appears a little rushed. Aiden Gillen who plays Ricky Roma (Pacino in the film) explodes on stage with a performance that is pure fun to watch. It’s a role that’s played loud here, rather than with Pacino’s subtlety, and the play works the better for it. The omission of the film scene where Alec Baldwin explains that the salesmen have until tonight to close deals or face the boot might leave some a bit bewildered about the plot. But as long as you remember they’re salesmen and they hustle for a living, that’s all you need to know.